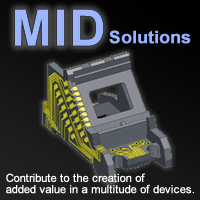 MID technologies contribute to the creation of added value in a multitude of devices. We offer our proprietary MIPTEC, MID (Three-dimensional injection molded circuit component) technologies to form circuits on the surfaces of injection molded components. We do this through custom orders to meet the diverse needs of our customers who seek miniaturization, feature advancement and improve efficiency in their devices. Strong resistance to various enviroments. For Board to Board and Board to FPC Connection. Narrow-pitch Connector Series F4S, F4, P5KF, P5KS. It contributes to the exhaust gas deletion and the energy saving and making to clean. Realization of high efficiency package through small and low-profile reflector structure. We've relaunched our MIPTEC website! Check out the latest information of the 3D Packaging Technology.